Every child of Italian heritage has heard of La Befana, a character in Italian folklore who delivers presents to children throughout Italy. It is believed that the legend of La Befana may have originated in Rome, then spread as a tradition to the rest of Italy.Some believe her name is derived from the word Epiphany, but others say La Befana descended Roman goddess named Strina. In folklore, Befana visits all the children of Italy on the eve of the 6th of January (the Epiphany) to fill their socks with candy and presents if they are good or a lump of coal or dark candy if they are bad. Because she is a good housekeeper, she will sweep the floor before she leaves. The child's family typically leaves a small glass of wine and a plate with a few morsels of food for La Befana.She is usually portrayed as an old lady riding a broomstick through the air wearing a black shawl and is covered in soot because she enters the children's houses through the chimney. She is often smiling and carries a bag or hamper filled with candy, gifts, or both. Christian legend has it that La Befana was approached by the magi (the biblical three kings) a few days before Christ's birth. They asked for directions to where the baby Jesus was, but she did not know. She provided them with shelter for a night, as she was considered the best housekeeper in the village with the most pleasant home. They invited her to join them on the journey to find the baby Jesus, but she declined, stating she was too busy with her housework. Later, La Befana had a change of heart, and tried to search out the astrologers and Jesus. That night she was not able to find them, so to this day, La Befana is searching for the baby Jesus. She leaves all the good children toys and candy, while the bad children get coal or bags of ashes. Another Christian legend takes a slightly darker tone. La Befana was an ordinary woman with a child whom she greatly loved. However, her child died, and her grief maddened her. Upon hearing news of Jesus' birth, she set out to see him, delusional that he was her son. She eventually met Jesus and presented him with gifts to make him happy. The infant Jesus was delighted, and he gave La Befana a gift in return; she would be the mother of every child in Italy. 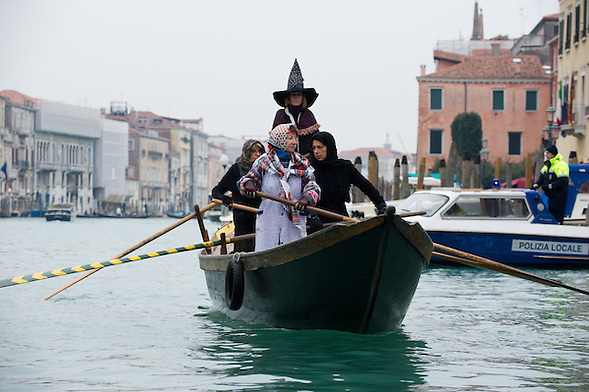 Italians believe that if one sees La Befana one will receive a thump from her broomstick because she doesn't wish to be seen. This aspect of the tradition may be designed to keep children in their beds while parents are distributing candy (or coal) and sweeping the floor on Epiphany Eve. Traditionally, all Italian children may expect to find a lump of "coal" in their stockings (actually rock candy made black with caramel coloring), as every child has been at least occasionally bad during the year.